Elon Law prepares its graduates to be not only successful lawyers who can excel at the highest levels of the profession, but also leading contributors to the well-being of the region, nation and world. 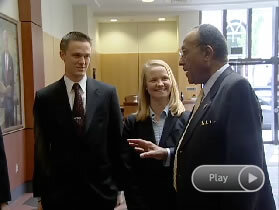 In addition to a rigorous core curriculum that allows students to develop extensive legal knowledge, taught by a faculty with a passion for innovative teaching, the school also provides students with in-depth skills training, teamwork experiences, opportunities for direct client engagement and an innovative Preceptor Program through which experienced lawyers from a broad range of practice settings mentor law students. We invite you to learn more about Elon Law's Leadership Program through the video series below, featuring students, alumni, faculty, and founders of the law school. Read an article about the Leadership Program from Elon Law's 2013 annual report. Working with members of the faculty and with practicing lawyers through the introductory course, Lawyering, Leadership, and Professionalism, first-year students begin to learn more about themselves and how their personal values and skills will shape their professional lives. In the second-year course, Public Law & Leadership, Elon students learn to work together in teams to tackle legal problems for nonprofit organizations and government agencies. The course gives students a hands-on opportunity to exercise leadership in the public arena by creating legal proposals for nonprofit and government entities. Third year law students have the opportunity to participate in the law school's Capstone Leadership Course, applying legal knowledge and leadership skills toward initiatives of their choice that benefit the profession, the community, or society more broadly. One of Elon Law's most distinctive characteristics is its Preceptor Program, through which more than 50 experienced lawyers from a broad range of practice settings mentor law students. Chief Justice Cheri Beasley, the first African-American woman to lead the Supreme Court of North Carolina, will share her wisdom at December's graduation ceremony for the Elon Law Class of 2019. "Elon Law in Greensboro: Past, Present, & Future" featured insights from civic, business, and higher education leaders who shared how the law school has played a role in transforming downtown into a robust nexus of learning and living.